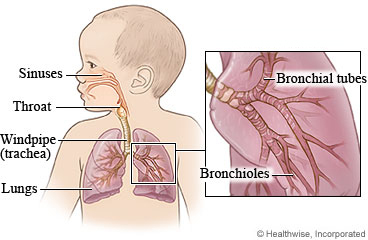 Bronchoconstriction, which may also be called reactive airway disease, occurs when the small airways (bronchial tubes) in your child's lungs spasm and become narrow. It causes wheezing, which is a whistling noise in your child's airways. This may be from a viral or bacterial infection. Or it may be from allergies, tobacco smoke, or something else in the environment. When your child is around these triggers, his or her body releases chemicals that make the airways get tight. Bronchoconstriction is a lot like asthma. Both can cause wheezing. But asthma is ongoing, while narrowing of the small airways in the lungs may occur only now and then. Your child may have tests to see if he or she has asthma. Your child may take the same medicines used to treat asthma. Good home care and follow-up care with your child's doctor can help your child recover. If you know what caused your child to wheeze (such as perfume or the odour of household chemicals), try to avoid it in the future. Teach your child to wash his or her hands several times a day. And try using hand gels or wipes that contain alcohol. This can prevent colds and other infections. Your child coughs up yellow, dark brown, or bloody mucus. Your child's wheezing gets worse. Enter J907 in the search box to learn more about "Wheezing in Children: Care Instructions".